Adventurers have been battling these creatures for more than 30 years - weird monsters born and bred to destroy heroes. You recognize them on sight: bulettes, cloakers, gelatinous cubes, mimics, otyughs, owlbears, purple worms, ropers, rust monsters, and shambling mounds. Some were created by the experiments of mad wizards, made to guard lonely towers. Others live exclusively in sewers and dungeons, products of niche evolution amid humanity's forgotten filth. All are fodder for the blades and spells of adventurers. But there's more to each of these beasts than meets the eye. 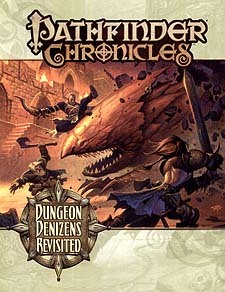 Within this book is detailed information on the motivations, tactics, ecology, and history of these classic monsters, all re-imagined for the Pathfinder Chronicles campaign setting while staying true to their roots as iconic elements of the game. Learn about rare and deadly variant creatures, and the best ways of separating them form their treasure. Buy customized equipment for hunting them, and learn new magic using pieces from their strange corpses. All your old enemies are here, and they're just as monstrous as your remember!